Bluetooth speakers today come in different shapes and forms, which is not that surprising, considering the size of the market. They are usually small and easy to carry. Many of them offer additional features such as water resistance or easy pairing. And these devices are getting better and better. 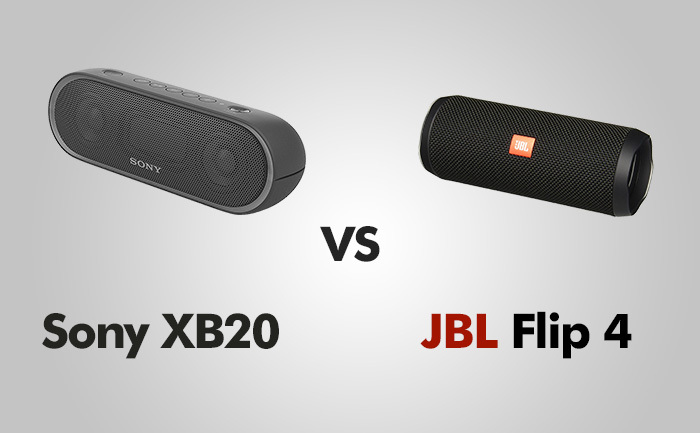 In this review, I’ll compare two different speakers XB20 from Sony and Flip 4 from JBL. Let’s see what they have to offer in their portable Bluetooth speakers: XB20 and Flip 4. I find the design of XB20 appealing. It’s compact, sturdy and stylish. What’s important to notice is that it’s made of dyed plastic, so it will keep its color even if you scratch the surface. The front of the speaker is accented by LED lights, which is quite cool, but also drains the battery. It’s just a gimmick that most people won’t use it very often. This speaker is available in 4 different colors: Black, Blue, Grey, Red. The one button that needs to be explained is the “add” button. This feature allows you to add another speaker for a wider stereo sound. If you want to connect your speaker with a wire, xb20 offers a 3.5 mm input. JBL Flip 4 is about 25% smaller than XB20 and a bit lighter. It measures about 6.9 inches (175 mm) wide and 2.7 inches (68 mm) in diameter and at both ends, it has this rubber caps with a rubber strip running across its back. If you put it horizontally, it will automatically roll to the most desired position where the driver will be pointing slightly up, so you get the best sound experience. It comes with a convenient lanyard so you can hand this speaker on the hook, tree branch, or just attached to your backpack. JBL Connect and the Power button are located on the back of the device. Between them are five tiny LEDs indicating the battery level. You can double-press the play button in order to skip to the next song. This speaker wins with Sony XB20 when it comes to portability. It’s smaller and has a great shape to carry around in one hand. It comes in a few colors: black, red, white, blue, gray and teal. Both models offer some kind of water resistance, but Flip 4 wins in this category. Contrary to XB20, it offers the IPX7 certificate, which means that you can submerge the device up to 3 feet (1 meter) for 30 minutes. XB20, thanks to its IPX5 certificate can withstand some rain, but don’t try it to throw it into a swimming pool. While it’s not the most powerful and best sounding speaker, it can fill a large room with plenty of sound. With two dedicated drivers and passive radiators, this speaker is much louder than you’d expect. If you want to have better sound experience, you can buy two speakers and sync them in the stereo mode. What is really impressive with this speaker is the bass. It’s not ‘muddy’ or overblown as you can get with other cheaper speakers. Additionally, it offers the extra bass feature. While it can be advantageous in some songs, it’s not always ideal, especially for the songs that already have a lot of bass. But you can always turn off this feature and the songs will sound more natural. Thanks to the dual-driver system, the speaker recreates mid-range and high frequencies in a great detail. JBL Flip 4 is not as good when it comes to sound quality as XB20. But you have to take into consideration that Flip 4 is much smaller and portable than XB20, and also waterproof, which is not good for sound. But it doesn’t mean that the sound is bad. It’s quite decent, especially for its size and can easily fill an average room with sound. Two 40 mm drivers can deliver quite a powerful sound and good bass thanks to its passive radiators which you can find at either side of the speaker, so you should place it on its side to avoid unnecessary sound distraction. Unlike UE Boom 2, Flip 4 doesn’t offer a 360-degree sound experience, so place it in a way that the JBL logo will point your direction. Besides powerful bass, this speaker also offers full mids and crisp highs. The JBL Flip 3 was already one of the best speakers under 100$, but JBL made improvements in this model, so it sounds even better. Sony has equipped its speaker with the NFC feature, which is helpful for Android for easy pairing. You can connect your device to the speaker without searching the device on your Bluetooth list. In order to connect your phone to the speaker, touch the speaker with your phone. The message will appear if you want to pair it. Another great feature that offers this speaker is the ability to pair multiple speakers and play them in sync. This feature is called wireless party chain. You can connect up to 10 devices this way. Although it doesn’t offer the NFC feature, you can connect a smartphone to this speaker quite easily. Just hold the dedicated button on the top of the speaker and select your device from the list. JBL offers a similar feature as Sony – it’s called JBL Connect+. In the newest implementation of this technology, you can connect 100+ other JBL Connect+ speakers in order to amplify the listening experience. The battery life is similar in both devices – about 12 hours of play on an average sound level. It’s ok but nothing spectacular, especially if you look at such monsters as Xtreme or Boombox, which can also be used as a powerbank. In Flip 4, as well as in other JBL speakers you can check how much battery life you have by looking at 5 small LEDs, indicating the battery level. PROS: Controls / Great sound / Extra bass feature / Cool light / Can pair multiple speakers / IPX5 water resistance. PROS: Portable / Good sound / Waterproof / LED battery indicator / IPX7 waterproof. CONS: Not waterproof. CONS: Not as good sound as in XB20.